PNLIT in today's Business Standard! Our Puttenahalli Lake features in today's weekend supplement of the Business Standard newspaper. 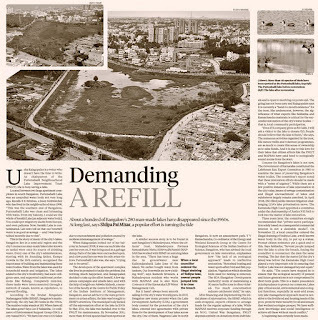 The article titled "Demanding a Refill" focuses on how a few citizens' groups are trying to revive the dying lakes in the city. The article can be read online here. On 19th Dec 2011, about 75 middle-school students of The Brigade School, and some staff members, visited Puttenahalli Lake for a hands-on morning.The children were given a briefing on the condition of the lake prior to its restoration (when it had almost vanished) and they could see the lake for themselves, after restoration. They familiarised themselves with the birds, trees and other life at the lake, through a Nature Walk with expert inputs from avid bird-watchers SK Srinivas and Prasanna. They also spent some time gardening, de-weeding and checking out the on-site waste management. In the newspapers yesterday (10th Dec 2011), you may have read about BBMP-PNLIT collaborating with a private firm Enzen Water Solutions to clean the water in the lake using a Nano-Nutrient Solution (NNS). Since it involved using chemicals, a trial run was done in a cement tank in the coconut grove, taking 15,000 litres of water from the dirtiest part of the lake into the tank. A week after treating the water, Enzen introduced 3 kg of Tilepia fish (22 numbers). Not only did the fish thrive but the water itself steadily gained clarity. The results of the trial were made public in a press conference at the lake on 9th Dec and has generated a great deal of interest as a possible solution to clean our city lakes. Officials from the BBMP, Enzen and PNLIT Trustees addressed the press. News9 is likely to telecast a capsule tonight between 10 and 10.30 p.m. or tomorrow morning. BBMP may introduce this method to clean the water in a month or so. By purifying the water and increasing the oxygen level, the NNS will control the growth of aquatic weeds and also promote fish life, consequently bringing more birds to our lake. As you can see, we are earnestly working on transforming the lake into an avian habitat. We need your help to sustain our effort. Please vote for PNLIT in Mahindra's Spark the Rise Championship. Click here and cast your vote. If you have voted already, please forward this message to your family, friends and their friends. One email id = One precious vote. The more votes we get the better the chance to win precious money to maintain the lake! 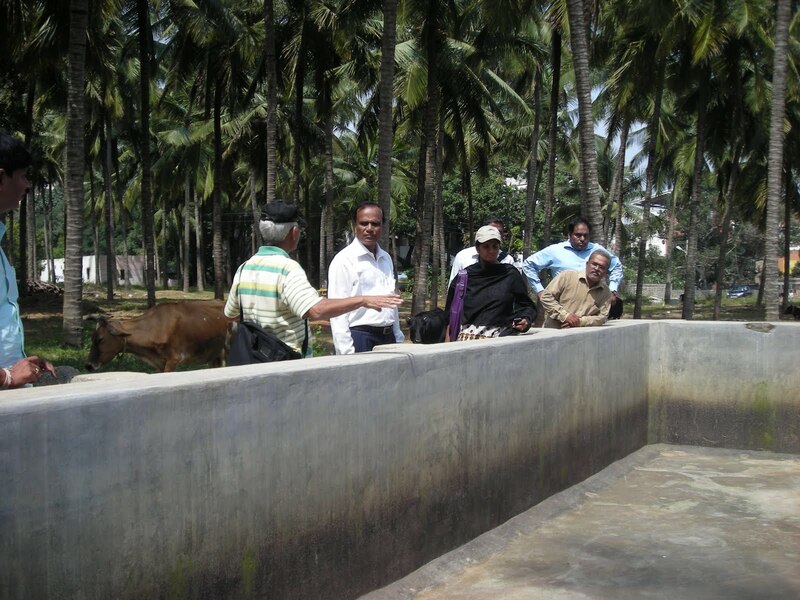 India Water Portal (@indiawater) mentioned you on Twitter! A compliment of a Tweet! PNLIT Shutterbug from South City, Sujesh, spotted "this guy checking out a hole in the dead tree near the lake". 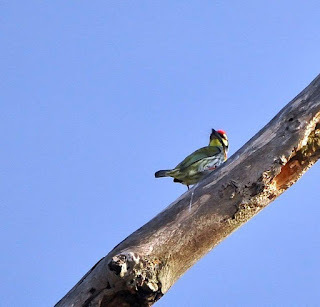 The guy is a Coppersmith Barbet which got its name because of its call - like a coppersmith striking metal with a hammer according to wikipedia. The wikipedia entry has some very interesting things to say about the Coppersmith Barbet. Do read it and see if you have Sujesh's eyesight to spot the bird! Do also use the weekend to vote for PNLIT! Please click on this link PNLIT - Nurturing Puttenahalli Lake back to its pristine glory. If you have voted already, please forward this message (and the photos) to your family, friends and their friends. One email id = One precious vote. The more votes we get the better the chance to win precious money to maintain the lake! As of now, our count is only 607 votes! Please let it touch a 1000 by this Monday! The number and species of ducks at the lake has increased! The Spot-billed duck pair is resident while more of the migrant Garganey ducks are making Puttenahalli lake, their winter home. 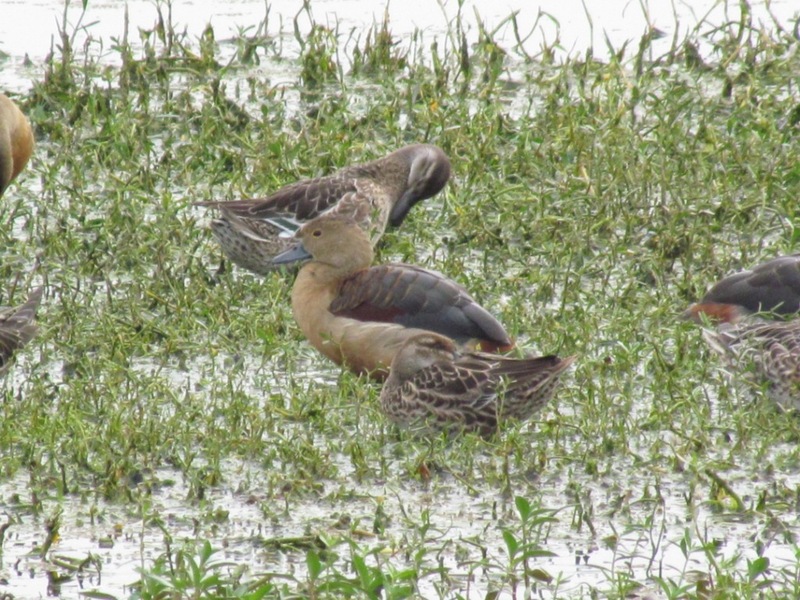 They are being joined of late by the Lesser Whistling Ducks (also called the Indian Whistling Duck) because of their distinctive wheezy call, this is normally a resident species. They were last seen in a very large flock in our lake in April this year. Now they are back again and are hobnobbing with the Garganeys! Together they are able to keep the Coots away and are settling down rather nicely. Here's wishing that their population will grow! More info on the Whistling Duck here. 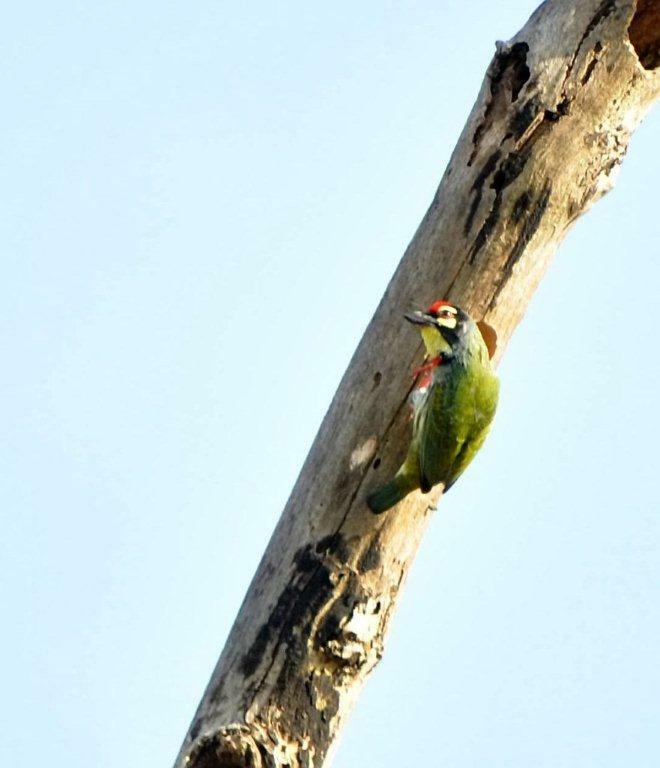 A photo of the two species together which Srini took last evening is here. If you'd like to see the ducks, please look for them towards the slum side about half way along that stretch. They are quite tiny so it will be a good idea to take your binoculars along. By the way, have you voted for PNLIT in Mahindra's Spark the Rise Championship?? If not, please click on this link and cast your vote. If you have voted already, please forward this message to your family, friends and their friends. One email id = One precious vote. The more votes we get the better the chance to win precious money to maintain the lake! Grabbing opportunities: help us with your vote! One doesn't always get an opportunity to do something extraordinary. When you do, you've got to grab it! This is what we did when we saw the Puttenahalli Lake dying. 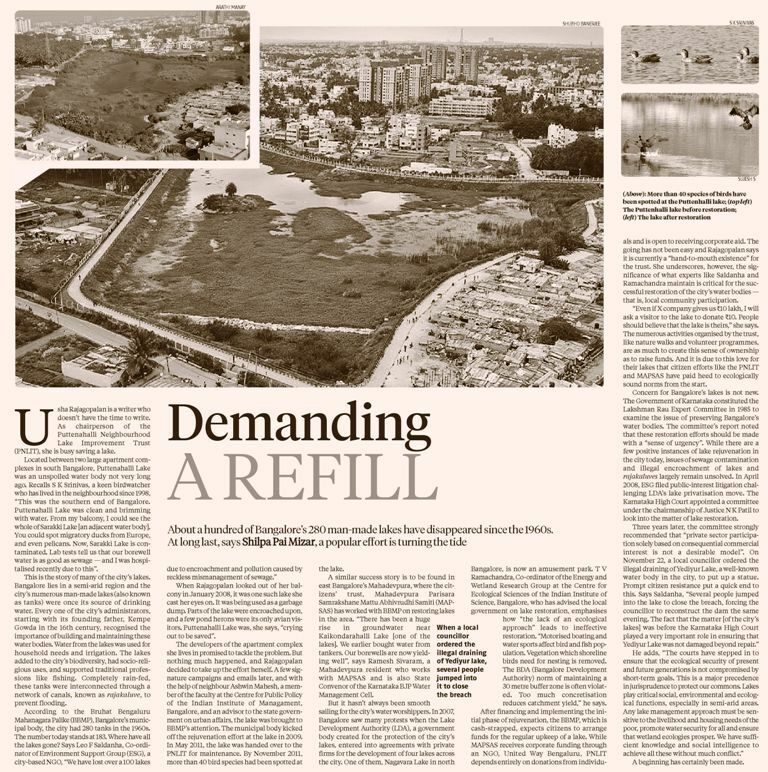 We campaigned and lobbied for the BBMP to rejuvenate the lake. This is what PNLIT did when we saw the Mahindra Spark the Rise announcement inviting projects ("Sparks") for a competitive funding. We submitted "PNLIT - Nurturing Puttenahalli Lake back to its pristine glory" as a template for reviving lakes with active public participation. Click here to vote. The many activities and events we conduct, such as the Children's Day Nature Walk, are done to enthuse residents in the locality to take care of the lake, to make them feel proud of "their" lake. However, it is a slow, tedious process since our lifestyle is increasingly distancing us and our children from Nature. Environment is something that we take for granted, not something to be nurtured. Freebies like the monsoon and the twitter of birds are often cursed and not appreciated. We meet the lake maintenance expenses from donations. We often get donors to plant trees. There is not only a monetary value attached to the Sampige or the Neem but also the priceless sentiment that the sapling has been planted by them and their families. They come around to see the tree growing tall and pluck the stray weed growing at its base. Such donations, however, are not really enough for us to transform the lake into the avian habitat that we want it to become. - Each month, Sparks are invited in five different categories, and after screening, put up for public voting. - Each month, 8 Sparks will receive grants of 4 lakh each. Five of these monthly winners will be selected by public vote. Of these, the 2 most-voted will be eligible to participate in the Grand Finale. The remaining three monthly winners will be selected by an expert jury. - In the Grand Finale, 18 Sparks will compete. The winner will receive Rs. 40 lakh and three runners-up Rs. 20 lakh each. Our Spark is open for voting through December (called Round 4). Emerging as the grand winner will be a dream come true. It will end our constant search for funds. It will erase the deep rooted concern that the birds which have now begun to flock, nest and roost in our lake may be left to fend for themselves for want of appropriate support. The public now has a chance to make a difference in this community project. Every vote counts. Please vote for Puttenahalli Lake to enter the Grand Finale. And pass on the link to get others to vote too. 3. Look for PNLIT. Click on it. Click on 'Vote'. 4. It will ask you to Signup or Login. 5. Click Login to go through Facebook or click Signup to go through email. 6. To Signup, put your name, email and password that you want to signup with. A confirmation mail will go to your email account. You need to click on the link in the email to activate your registration. 7. After activation, you do the same thing to vote. Don't think that your one vote won't make a difference, because it will! from the walkway of the lake to the island in the middle of the lake. "It would be nice to let people go into the island and get a good view of the lake," says L Ramesh. PNLIT member Usha Rajagopalan says that the project would drive away birds. "There are about 45 bird species, local and migrant, that are visiting the island and areas around the lake. Presence of people will drive them away and also cause the lake to be littered," she says. Usha says that PNLIT's plan itself was to develop the lake as a bird sanctuary, and that trees were planted in the island for this. "The issue is of BBMP looking at lake development from the perspective of entertainment to public. BBMP does not consider the eco-perspective," she says. L Ramesh says that the project has been dropped due to residents' protest and also since there are not enough funds allocated in the budget for the lake. "BBMP has only Rs 25 lakh funding for the lake this year, which we will use for installing lights around it. The bridge project has been completely dropped," he says. "PNLIT - Nurturing Puttenahalli Lake back to its pristine glory"
is live on Mahindra Rise Spark the Rise (Round 4). Mahindra is awarding 8 grants (Rs 4 lakh each) through December 2011 - 5 by popular vote and 3 by jury selection. where there are also 4 grand prizes (3 of Rs 20 lakh each and one of Rs 40 lakh). 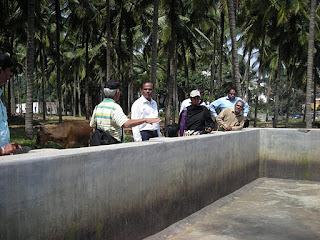 A grant from Mahindra would change things for PNLIT and our effort at nurturing Puttenahalli Lake. We need your vote to help win this much needed financial support. All you need to do is vote and pass the link to others to vote! Every vote counts. You can make a difference. Our lake is full of surprises. One only needs to be vigilant to see what the lake has to offer. Srini, who now no longer needs any introduction, was the first to spot the Garganey ducks which has been reported in today's Hindu Metroplus. 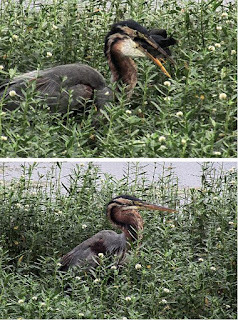 Today he managed to capture the rare sight of the purple heron eating another bird. 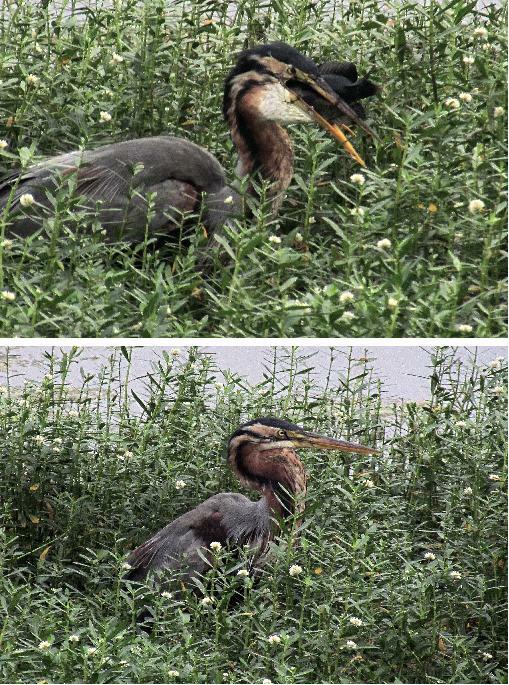 The first picture shows the heron gulping down the unfortunate coot and the second shows the heron with a large bulge in its throat, as it struggles to ingest the prey. I was fortunate (or unfortunate!) to see this happen about a month ago but was so awed by the sight that neither I nor the members of the Bird Watchers Field Club even thought of taking a photograph!